Conditions have already been set for society to come unglued. The rioting, looting, poaching and running to the border for food supplies that has already taken place demonstrates a people who are already stressed to the breaking point. The impact on individual health, and the instability surrounding everyday activities has already shown through, and things are only getting worse. So, too, has the police state. Socialist President Maduro has many opponents who wish to see his ouster. The nation’s thin dependence on high oil prices has made their economy easy to hack. Unfortunately, the people are paying the price. Maduro must use a strong arm and an iron fist in order to cling to power, just like every other dictator – communist, fascist, socialist or otherwise. 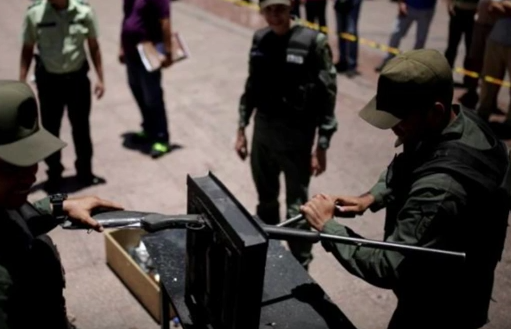 Venezuelan police crushed and chopped up nearly 2,000 shotguns and pistols in a Caracas city square on Wednesday, as the new interior minister relaunched a long-stalled gun control campaign in one of the world’s most crime-ridden countries. “We are going to bring disarmament and peace,” Reverol [a pro-Maduro former anti-drug tsar accused of drug trafficking corruption] told reporters, while police officers drilled and sawed at rusty shotguns, home made pistols and some newer weapons. Venezuela has also bought laser technology to mark ammunition, Reverol said, in an attempt to keep a registry of the bullets given out to the South American nation’s many state and municipal police forces. Their form of gun control means, of course, that only the police, the military and the criminals will have guns – even though they officially acknowledge that police corruption – with resources and salaries under pressure – is the biggest factor in arming gangs. Everyone else must hope for the decency and restraint of these privileged groups of people – police, military and criminal gangs – upon whose mercy they must rely during the collapse of their nation. What happens in a country where food is scarce, and those with guns can get everyone else to do what they want for food? What happens when there is a monopoly on “protection” and self-defense is outlawed? Gun control, of course. Venezuela, of course, has already imposed strict control, but this is a renewed focus. Caracas is the murder capital of the world, and has had a very high murder rate for decades. But when 2012 saw tougher gun laws, the murder rate actually climbed even higher. Private gun ownership was banned in Venezuela in June 2012, but their homicide rate went from 73 per 100,000 people in 2012 to 82 per 100,000 people in 2015. The BBC seriously repeats the Venezuelan government’s claim that the ban is an “attempt by the government to improve security and cut crime.” The ban was preceded by an amnesty to get people to turn in their guns. The video gives some idea of what life is like in Venezuela these days. The “renewed focus” on disarming the population only shows how far the State is willing to go to keep order on its terms. It won’t stop crime, but thousands of crushed guns, and in the midst of the biggest crisis ever in Venezuela… actually, it is a sign of darker things to come. Suspicion, purges and domestic repression are all inevitable from here. The corruption will be squeezed out of the walls as Venezuelans, caught it he middle, struggle to hold on to decency. How can people who are angry at the government and who want its leader thrown out to be kept down? How far is the regime willing go? Opposing the regime or breaking the rules in order to feed families will be an increasingly risky behavior. News flash: this could happen in the United States overnight under a Hillary Clinton presidency. All they need is the right crisis to suspend rights and the rule of law. This article was posted in 2016, Conspiracy Fact and Theory, disarming population, Economic Collapse, Emergency Preparedness, forecasting, gangs, Headline News, Hungry, Maduro, Police, socialism, United States and tagged food, guns, Hillary, Venezuela. Bookmark the permalink. Follow comments with the RSS feed for this post.Comments are closed, but you can leave a trackback: Trackback URL.